When a tree falls in the forest, Mike Ross sees décor, not debris. The Bend-based craftsman uses salvaged timber—typically culled from parks and lawns across the Pacific Northwest—to fashion thoroughly modern furnishings inspired by the wood’s natural curves, knots, and quirks. 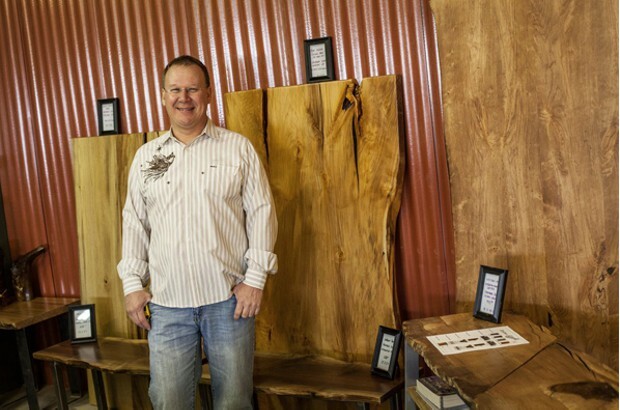 He sells his one-of-a-kind pieces out of a showroom attached to the eastside workshop Natural Edge Furniture he opened in 2011. The earthy scents of cedar, oak, maple, and alder waft through the bright and airy showroom from the bustling workspace in back, where members of Ross’s five-person team arrange seemingly incongruent pieces of wood into artful puzzles and weld steel into frames for tables and chairs. Inspiration for the pieces Ross describes as “contemporary organic” first struck when the 30-year veteran of the wood products industry pondered what to do with the “homeless” trees at his Longview sawmill—those not suited for the cedar grilling planks he was producing. The impulse to give new life to what would otherwise be discarded, however, was not new. Ross says he made his first piece of furniture at the tender age of 6, using scrap materials from one of his grandfather’s projects to build a chair. “I haven’t really stopped since then,” he explains. Playing a part in the rebirth of one of Ross’s great loves—trees—stokes his creative fire. “It’s kind of cool to take a tree that was a tree house and then use it inside of a house,” Ross says, adding that remnants of past uses, such as nails, wire, and even bullets are left in the wood, to retain character. While Ross does most of the initial design work, it’s the materials that are in charge. Ross says he couples the natural qualities of the trees with a contemporary sense of style inspired by the Museum of Modern Design in Copenhagen. It takes a lot of imagination, and a little faith, to see the end in the beginning. When the slabs of wood arrive in the studio after years of air-drying, their potential is well hidden. The hunks of wood are dull, matte and unremarkable. But Ross sees something in them that others don’t. While Ross says he mostly looks at trees and sees tables, Natural Edge creates a wide range of furniture and home décor, including desks, headboards, chairs, wine racks, bookshelves, entertainment centers and even wall art. In addition to the pieces that come from his own imagination, Ross and his team also create custom work. Clients can bring in sketches and even select the specific pieces of wood they want the item to be built with. “Every piece is an enjoyable process. It’s always a challenge,” he says. And Ross rises to the occasion, continuing to hone his craft and find new ways to reduce his company’s carbon footprint. Though Natural Edge already uses salvaged materials and natural drying methods, Ross says he’s still seeking out greener finishes to replace the standard polyurethane.